Can a Defensive Driving Course Lower My Car Insurance Rate? Are you thinking of completing a defensive driving course to lower your car insurance rate? Every state is different when it comes to car insurance laws and traffic violations. And car insurance carriers are all different when it comes to rating factors and possible discounts. That makes for a lot of variables. Most people would jump at the chance to lower their car insurance premiums, and every little bit helps. Growing up, your parents or driving instructors probably told you that you always want to be a defensive driver -- but what does that mean? It means being a safe driver, for one, but it means more than that. It includes learning and remembering to keep your eyes on the road, expect the unexpected, keep your speed under the speed limit (but not too slow! ), driving in a manner appropriate to the weather (knowing when and how to use your wipers, for example), and avoiding distractions like food and cell phones while in the car. If it’s still not clear what is included in defensive driving, or if you feel like you may need a refresher, a defensive driving course could be a good option. Can a Defensive Driving Course Lower Your Car Insurance Rate? Just looking to lower your car insurance rate by voluntarily taking the course without any type of traffic violation involved is possible. Actually, that is probably the only time some insurance carriers offer such a discount, however, the savings may barely cover the cost of traffic school. Never have I seen a huge discount offered by an insurance carrier worthy of taking the course as a stand-alone way of saving money. It is nice to receive a discount if you were planning on taking the course anyway though. So if you are interested in increasing your road knowledge, ask your car insurance agent if a discount is available. 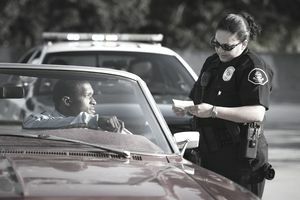 Can It Lower Your Car Insurance Rate if You Received a Traffic Ticket? Yes, but this one depends greatly on which state you received the ticket. The state of Arizona offers an excellent traffic safety course program after receiving a minor traffic violation. Florida does too. In Michigan, we are not so lucky. Check with the Motor Vehicle Division near where you received the ticket to see if they offer defensive driving courses to avoid penalties. Meet your state department rules for defensive driving course eligibility. Usually, the rules include not recently taking the course to have a ticket dismissed. No serious injury or death was involved in the incident. You cannot have a commercial driver's license. And most likely it is only going to work for one violation, so if you received multiple violations in one incident, it is doubtful you are going to be eligible. Complete the approved course in the time frame allotted ahead of your court appearance. Check to see when your deadline is, so you do not get caught completing the course too late to be valid. Once you have submitted the course completion and it was accepted by the state, all points and fines could potentially be waived. Again, it depends on the terms of the state. Assuming all points were waived, your car insurance premium will not go up. You will not receive a discount, however avoiding a hefty surcharge is equivalent to saving money on your car insurance. Not incurring those points on your driver's license does more than keeping your car insurance rate intact. Points adding up on your record can result in driver's license suspension and even revocation if you are a frequent offender. Avoiding the points now could help you avoid those tougher penalties in the future. You might learn something about traffic safety that you can use in a future real-life situation. If not, then at least hopefully you learned your lesson about not following the rules of the road. Taking a defensive driving course to save money on car insurance is not likely. You could, however, learn a thing or two and recoup the cost of the class with a small discount provided by your car insurance carrier. The benefits of taking the course to get a traffic ticket dismissed are far too great to pass up. If your state offers it, definitely take the course.